Kit Berry is a pagan author, who comes from Dorset who has created a new series of five books set in a world of magic, myth and mystery. Her books are the sort you will find hard to put down, and I would go as far as saying, and have already said, that I think that she could eventually be as successful as JK Rowling! The author has seen her dream to become a successful author become a reality. Her inspiration has taken her from being able to quit her past job as a teacher and to become a full-time professional author. The demand for her books that started in the UK has now embraced America. The books are set in the world of Stonewylde where everything appears to be harmonius and the perfect society. It is shielded from the outside world we all know so well but underneath there lies a much darker and sinister side embodied in Book One in the mysterious Magus who runs it all and is not what at first he appears to be. The series begins with The Magus of Stonewylde and is followed by Moondance of Stonewylde, Solstice of Stonewylde, Shadows at Stonewylde, and Shaman of Stonewylde, all published by Moongazy Publishing. Kit Berry's books have all the elements of a classic story - there is Sylvie the heroine and as we would expect, a romantic interest in the boy Yul, there is an interplay of good and bad at work, and we meet heroes and villains in another world to which the author transports you to with ease, a world of standing stones and Earth magic of witchcraft, prophecy and passion, a world where the ancient past is interwoven with the present in a timeless alchemy. Besides all these elements, running as an undercurrent, there is a political comment on the division of wealth in society, about class and about power struggles.There are the "Hallfolk" and the "Villagers." There is the struggle between the patriarchal world and the matriarchal between the God and Goddess, between the man and the woman, between the natural world and the modern world. The books are an excellent introduction to pagan beliefs because Stonewylde is governed by the forces of nature and supernature, where the seasonal calendar of the festivals like the equinoxes and solstices are important points in the year. The full moon is a time of magical power and the heroine Sylvie gets "moongazy," but you'll have to read the books to find out exactly what that means unless you can guess! The Green Man, the May Queen and the magic of Beltane play an important part in the story and there is the battle for power between the Oak King and the Holly King, a story that pagan-readers will recognise and enjoy, however, Berry's books can be just as enjoyable for non-pagans as well. 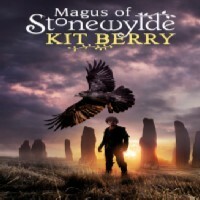 Kit Berry's Stonewylde series can be read and enjoyed by just about anyone and that is part of the author's own magic. You are welcome! They really are top quality stories and I'm not just saying that because I know the author! I'm always looking for new authors. This series looks like something I'll enjoy reading this winter, curled up by the fire. Thanks for recommending it! Tinkinswood Burial Chamber has a massive capstone and is really worth seeing but many people know nothing about this ancient site just outside Cardiff.